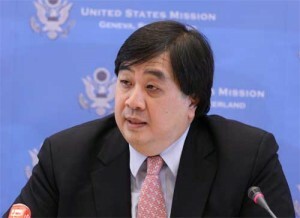 In early November, when the United States had its human rights record reviewed by the United Nations in Geneva, U.S. State Department legal advisor Harold Koh assured the world that all alleged abuses of detainees in the custody of the U.S. military “have been thoroughly investigated and appropriate corrective action has been taken,” and that Special Prosecutor John Durham was actively investigating allegations of torture by the CIA and other civilian agencies. Drawing largely from material covered on the ACLU’s Torture Report website, I have come up with a list of 10 follow-up questions that the press and public at large—indeed, all of us—should be asking the Obama administration about the status of U.S. compliance with its domestic and international commitments on Torture and Cruel, Inhuman, and Degrading Treatment. 1. In January 2009, Susan Crawford, the former Convening Authority of the Guantánamo Military Commissions, publicly acknowledged she had not referred Mohammed Al-Qahtani's case for prosecution because “We tortured Qahtani”; his treatment, she said, “met the legal definition of torture.” Can you list the names and ranks of all military personnel who have been investigated for ordering and carrying out his interrogation, and the status and results of any court-martial or other disciplinary proceedings that resulted from those investigations? 2. In Farhi Saeed Bin Mohammed's habeas proceedings, Judge Gladys Kessler disallowed evidence she concluded had been “obtained by torture,” including statements by Binyam Mohammed, who she found had been abused in Pakistan at the direction of the United States and who was then tortured in Morocco and the CIA's “Dark Prison” in Afghanistan. This month, the government of the United Kingdom reached a settlement agreement that includes substantial financial compensation to Binyam Mohammed for its own complicity in his U.S.-orchestrated torture. Is the treatment of Mohammed the subject of any past or current U.S. investigation? Who has been prosecuted or disciplined in connection with his torture? 3. When Guantánamo detainee Mohammed Jawad came before the Military Commission, military judge Colonel Stephen Henley found that the “frequent flyer” sleep deprivation regime to which Jawad had been subjected from May 7 to May 20, 2004 constituted cruel, abusive and inhuman treatment. During the commission proceedings, the officer in charge of the “frequent flyer program” presented testimony and evidence that the treatment Mohammed Jawad suffered was “standard operating procedure” and was used on many detainees at least until April 2005. Mohammed Jawad’s military defense counsel, Lieutenant Colonel David Frakt, filed a Law of Armed Conflict Violation report, the formal notice by which military personnel alert their superiors that a possible war crime has occurred, when he first discovered this abuse in May 2008. He repeatedly requested to be informed of the status of the investigation, but it appears that no investigation was ever initiated, even when the matter was reported in the Washington Post and the Washington Independent. Lt. Col. Frakt has never been contacted by anyone in the Defense Department concerning his report. 4. In granting the habeas corpus petition of Uthman Abdul Rahim Mohammed Uthman in March 2010, Judge Henry Kennedy Jr. wrote, “The court will not rely on the statements of Guantánamo detainees [Sharqwi Abdu Ali Al-] Hajj and [Sana Yislam Ali Al] Kazimi because there is unrebutted evidence in that record that, at the time of the interrogations at which they made the statements, both men had recently been tortured”—Hajj first in Jordan and then at the CIA's “Dark Prison” in Afghanistan, and Kazimi in both the United Arab Emirates and the Dark Prison. Who ordered the rendition of Hajj and Kazimi to third countries and their abuse in CIA custody in Afghanistan , and who, if anyone, has been investigated or prosecuted in connection with their torture? Is their treatment in CIA custody in Afghanistan under investigation by Special Prosecutor John Durham? 5. The International Committee of the Red Cross concluded in 2007 that the treatment of Abu Zubaydah at the CIA black site in Thailand and the use of many of the same “enhanced interrogation techniques” on 13 other “high value detainees” in secret CIA prisons included torture and cruel, inhuman, and degrading treatment, both prohibited under the Geneva Conventions and the 1984 UN Convention Against Torture. Zubaydah's account to the Red Cross of his ordeal matches the August 1, 2002 Office of Legal Counsel memos authorizing his torture exactly, and videotapes of his interrogation showed that it proceeded precisely as directed and approved from Washington. Is Special Prosecutor John Durham investigating the torture of Abu Zubaydah? Does his investigation reach both to the interrogation team, led by Dr. James Mitchell, who designed the so-called “enhanced interrogation techniques,” and to the senior Bush administration officials who approved and monitored Abu Zubaydah's torture? 6. The CIA Inspector General's investigation into the use of “enhanced interrogation techniques” revealed that a number of “unauthorized” techniques were used against Khaled Sheikh Mohammed and Abd al-Rahim al-Nahiri such as threats with a handgun and power drill and threats against family members. Who has been held accountable for those “unauthorized” techniques, and what punishments if any were given? 7. In November 2002, the CIA tortured a detainee recently identified as Gul Rahman to death at its secret “Salt Pit” interrogation facility in Afghanistan, stripping him, shackling him, dousing him with water, and leaving him exposed in frigid weather overnight; he died of hypothermia. It has been reported that Attorney General Eric Holder specifically directed Special Prosecutor John Durham to investigate this case and others that the CIA's Inspector General had referred to the Justice Department, only to have the Bush Justice Department decline to prosecute. Is the Justice Department in fact investigating the Salt Pit killing? What is the status of Durham 's investigation, if any, of this case? 8. Maher Arar and Khaled El-Masri were concededly innocent individuals mistakenly swept up into the CIA's rendition program. Canada has publicly acknowledged the mistake and partially compensated Maher Arar for its role in his torture and a case is proceeding against Macedonia at the European Court of Human Rights for collaborating with the United States in the rendition and torture of Khaled El Masri. By contrast, in the United States , Arar's and El Masri's lawsuits have been thrown out of court before ever getting to the merits. What investigations have been conducted in the United States into their torture, and who has been held accountable? 9. A 2006 report by Human Rights First titled Command's Responsibility found that nearly 100 detainees had died in U.S. custody in the global “war on terror.” This number does not include battlefield deaths; it counts only deaths during interrogation in U.S.-run facilities and people killed after they had surrendered to U.S. forces. According to military records available to Human Rights First investigators at the time, 34 of these deaths were either confirmed or suspected homicides, and at least 11 more to have been the result of abuse or detention conditions. Since Human Rights First's report came out, military documents and credible media accounts indicate that many more detainees have died in U.S. custody. Please provide a list of all investigations into deaths of detainees in U.S. military custody, any criminal and administrative proceedings stemming from investigations, and any resulting sanctions. What is the highest rank of U.S. servicemembers punished in connection with the death of a detainee? 10. Military interrogators in Guantánamo followed the brutal interrogation of Mohammed Al Qahtani with a similar “special interrogation” of another detainee, Mohamedou Ould Slahi, this one involving threats of torture against his family, a mock rendition, and threatened execution. In Slahi's case, Lieutenant Colonel Stuart Couch, the navy prosecutor assigned to prepare his case for the military commissions, discovered that Slahi had been tortured and refused to prosecute his case. Earlier this year, a federal judge hearing Slahi's habeas corpus petition similarly concluded that many of his statements were extracted through torture, and ultimately found that the government had failed to prove its case against Slahi, ordering him released. The government attempted to reverse that decision on appeal, but the appellate court agreed only to send the case back to the trial court for additional proceedings. As with Qahtani, can you list the names and ranks of all military personnel who have been investigated for ordering and carrying out Mohamedou Ould Slahi's interrogation, and the status and results of any court-martial or other disciplinary proceedings that resulted from those investigations?